As someone who has had depression on and off for many years at different levels, I do not relate to this. Everyone experiences depression differently and if the battling narrative works for you then that’s fine. My problem is with it being the only narrative. For me, firstly, I don’t think I will ever “beat” depression. I think depression is as much a part of me as my faulty joints. Which means fighting depression is not something I will ever win and fighting depression is essentially fighting myself and my DNA. I have spent a lot of years at war with myself, I don’t want to keep fighting. Secondly, it suggests that if you have depression, you are weak or you aren’t fighting hard enough. Which makes it your fault. By accepting my depression and slowly integrating it into myself, I have found I am much more able to manage it. When I tell people that I want to put things in place for the next time my depression is severe, I get told not to be so pessimistic, I have to believe that I’m cured etc. But this isn’t realistic. For most of my life I have been depressed, why would this just disappear? And my acceptance of this means I can plan, I can set up helpful routines and check ins when I’m doing better in preparation for when I’m not. I can work with my depression rather than against it. Working with my depression means noticing it. It means saying ok, things aren’t great today, lets engage in some gentle self care, yay you made it out of bed, congrats… let’s pause for today and see if that helps make tomorrow easier. It means noticing that I am being really irritable and instead of beating myself up about it, I can acknowledge that my depression is playing a role and to ease the irritability, I probably need to look at how I can ease the depression. As I said, everyone has different experiences with depression and for me, accepting it as a lifelong part of me means I am more likely to spend my time and energy caring for myself rather than fighting myself. I’ve been told before that I can’t have real depression because I was able to get out of bed and work. It was a horrible thing to hear. Yes, I did get out of bed and get to work but it took everything I had and it hurt like hell to do. But equally, there was no way I couldn’t not go to work. I have the curse of high functioning depression. My depression does not look like most people think depression should look. And that means I don’t always get taken as seriously as I need and I get dismissed by friends, acquaintances and medical professionals. I probably look my most professional and most together when my depression is at its worst. Only then do I wear makeup, dress smartly etc. I am not me at those times. If you ever see my wearing a suit, I am probably a complete and utter mess inside. I was an A* student throughout school and left university with a masters in mathematics and the entire time I was severely depressed, suicidal, self harming and going through periods of anorexia. No one ever thought to look past that to see what I was hiding. No one ever saw my depression. People have told me time and time again how strong I am and make it sound like a compliment. But inside I am screaming that I don’t want to be strong. I want to collapse in a heap and cry and never get out of bed and never speak to anyone ever again. But I don’t think I will ever be able to do that. I function with my depression. Or at least I do my best to make it look like I am. I go through the motions whilst desperately wishing I no longer existed. One of my major triggers is invalidation. And the stereotypical symptoms or pictures people have of depression have led me time and time again to question my own depression. Doubting myself made me expect the rest of the world to doubt me. If I doubted it, would my GP just laugh at me? Depression comes in many forms and looks like many different things. If someone has taken the time and effort to tell you they’re struggling, don’t tell them they aren’t. I had a small rant on twitter last night about the NHS’s approach to depression and then woke up to see a tweet about how exercise cures depression. THERE IS NO ONE FIX FOR DEPRESSION. EVERYONE IS DIFFERENT. At the moment the NHS is focused heavily on a version of mindfulness. I say a version of, because, like so many things, the NHS is using a watered down version and assuming it’ll fix everyone and everything. Depression? Mindfulness will fix it. Anxiety? Yup, mindfulness for that too. Mindfulness is even rolled out for managing pain. And yes, mindfulness has benefits for some people in some circumstances. This is not at all a rant about mindfulness. Before mindfulness, CBT was the fix all. But it wasn’t CBT as it is supposed to be. It was CBT delivered by phone, through internet programmes or in very short courses. I find these trends in treatment aborrent. Treatment shouldn’t be guided by fashions. It should start with the person. A personalised approach is the only way that you should be looking at this. Medication works for some people. And not others. Exercise helps some people. And not others. CBT helps some people. And not others. Mindfulness helps some people. And not others. My experience of different mental health treatments has been varied. The first antidepressents I tried increased my anxiety. The one I’m on now seems to be ok. I tried CBT but that made me worse. I tried mindfulness and that makes my physical pain worse. I would try exercise except I can’t. For me, a combination of medication and Cognitive Analytical Therapy alongside creative work such as art journalling and self check in methods such as tarot, have helped me. What doesn’t help is being put in a box and given only what the NHS decide is fashionable. What doesn’t help is being given your four weeks of CBT and then not being able to access any other support because you’ve already had your alloted support. What doesn’t help is the media pushing cures and people shaming me for not exercising. Everyone is different. Let’s start treating them differently. Let’s have a range of tools and see what helps. When i was living at my parents, i would hide away under my desk or in the bottom of my wardrobe. I had a torch, a night light, books, notebooks, saved snacks and a bottle of water. I would stay in my den for hours and hours and pretend that the outside world wasn’t there. My mother got annoyed with me because I wouldn’t answer and she couldn’t find me (the door was shut on the wardrobe). When my latest period of depression was at its most soul wrenching levels of pain I would long to hide under the desk at work. I would shut myself away in the toilets and curl up as small as I could. Partly I didn’t want to take up space. I didn’t feel I should take up space. And partly because sheltering under a table or behind a door felt safer. All children make dens and hideaways. But I suspect most children or teenagers don’t seek refuge in their wardrobes day after day after day. As a physically disabled adult, I can no longer hide in my wardrobe or under a table. For a while, my psychologist provided me with a safe place. A space where my feelings could be felt and would be contained. She held the space and the room gave me boundaries. But that is gone. I am no longer able to access that support. I have had my alloted hours. The limited support I get from the mental health team now does no offer me that same sense of safety. I am not able to use it to access my emotions in the same way. And I don’t know how I can create, both in time and in space, a similar safe place for myself. Thinking back, the wardrobe offered comfort and it also offered a space away from holding the mask in front of my depression. It offered me a small, well defined repository for my emotions. Closing the door on the way out closed that space. In the same way that walking out of my therapy building offered a clear transition away from that vulnerable emotional place to the rest of the world. I have numbed myself off a lot since therapy started drawing to an end. It’s not a conscious thing. It’s not a reaction to feelings. I have numbed myself out in preparation for feelings. I have techniques and tools for helping manage my depression but I don’t have a place I feel safe enough to allow my emotions to come out. In my check ins I get odd little tiny glimpses, academic insight into how i should be feeling or why i have reacted in particular ways. But I am not able to really feel the feeling. It’s like I can almost see it but I am not yet able to feel it. My mental health support team, what little remains, isn’t turning out to be very helpful with this. I get told to just let myself feel… If anyone has suggestions, I would be grateful. Having been suicidal, lost someone to suicide and helped people who are suicidal, it’s incredibly important to me that we talk about suicide. We need to practice saying the word so it’s no longer taboo. We need to get familiar with what we can do to help people rather than keeping it secretive and turning a blind eye. As with all mental health issues, I strongly believe we need to talk about it. This year’s theme is about understanding the impact that reaching out to people at risk can have in preventing suicide, and ultimately saving lives. Over 800,000 people die from suicide across the world each year (WHO report) although this is likely to be an underestimate. I have heard people say many things about suicide but from those who haven’t been suicidal something that comes up repeatedly is that it’s selfish. I understand that these may be people who are grieving and going through natural stages of anger etc but suicide is not selfish. 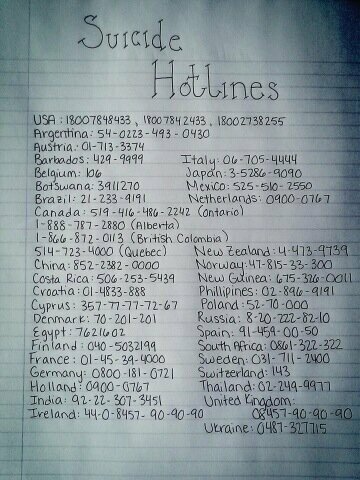 If you have been suicidal, you know that it feels like your only choice. You are in so much incredible pain, suffering or are intensely numb that you can’t see a way to continue. There may be other reasons you feel like this. I am not in any way saying this is an extensive list of reasons why someone might consider suicide. I just know that I’ve been there. And it wasn’t selfish. I was in agonising despair. I couldn’t see anyone around me. I didn’t want to burden anyone. That, to me at the time, felt selfish. Suicide didn’t. It felt like my only choice, my only way out of an intensely horrible situation. I felt like there was no way I could continue to feel the way I did. I felt like no one cared. I was at a point where I was unable to reach out and ask for help. And having someone ask me genuinely what was wrong, or notice that things weren’t good would have helped me start to see that people were there and did care. I think I did want people to know but I couldn’t tell them myself. I didn’t reach the point of attempting intentional suicide – let me explain, I wasn’t implementing a plan but I wasn’t looking when I crossed roads etc. I didn’t reach that point because my maladjusted coping mechanisms kicked in and numbed out the horrendous feelings. Essentially, as twisted as it sounds, anorexia saved me from suicide. But that’s a whole different story! And I’ve been on the other side. I lost a friend, Jon, a couple of years ago. It is a hard loss to deal with. In some ways it feels more complex than death due to illness or old age. You are left asking yourself so many questions – what could I have done? Why didn’t I do x or say y? Why didn’t he tell me? What if…? At some point after, his brother was looking through his phone and saw I’d been texting him a lot (his family didn’t realise we were still in contact) and got in touch to let me know if I wanted to talk to his family I could do. Which felt like a huge gesture. But the thing that sticks in my mind was when his brother told me that he understood Jon’s choice. He understood why he had done it. And when I feel angry or frustrated about Jon’s death, I remember that and it helps to bring me closer to peace. If you have lost someone as a result of suicide, make sure you get the support you need. Grief is always difficult and it’s important to keep talking to family and friends but you may also need some more formal support. In the UK, you may want to reach out to Survivors of Bereavement by Suicide. What can you do if you know someone is suicidal? The Samaritans have advice about starting a difficult conversation. And it probably will be difficult but it’s probably a darn sight easier for you to reach out than for the other person to ask for help. Please be aware, you are not responsible for someone else’s feelings or actions. And it is vital that you look after yourself as well. You can’t always be available for your friend or family member so ensure they have information about helplines and encourage them to seek more formal support. Helplines are one option, in the UK there is the Samaritans (08457 90 90 90) amongst others. Friends and family are another option. And healthcare professionals. Or other professionals or church members or anyone else you feel able to talk to. Tell twitter or facebook (preferably as well as telling someone specific but if you can’t manage that then social media is better than nothing). If you feel at immediate risk of harming yourself, you can go to A&E or ring 999 (in the UK). When I saw Mind asking “Has crafting boosted your mental health?” on twitter, my reaction was well yes, of course, what a stupid question! But of course it isn’t a silly question at all. We live in a society where so many people believe they aren’t creative and because of that would never think to turn towards craft as a hobby or way of coping with life. As far as I can tell, a huge part of this belief comes from art lessons in school which focus heavily on techniques and reproducing things in life like quality. For me, this isn’t my version of creativity. For me, creativity is about expression. Crafting has been a part of my life for a long time in various different forms. As a side note, I have a chronic pain condition which is deteriorating and means I am not able to do all of the craft that I used to be able to. Knitting has provided a therapeutic repetitive task which has helped to calm me and has given me an almost mindfulness experience. When anxious, it has helped to slow things down for me. When depressed, it’s helped me feel like I am achieving something – I am doing something useful. I’ve scrapbooked photos, for example it might be from a trip you’ve taken or of a child growing up. As well as the distraction and immersion of the activity, it can also help you to recall good memories. I’ve done card making, candle making, cross stitch, sewing little decorations out of felt, you name it, I’ve probably had a go. The one thing they all have in common for me is a sense of satisfaction, feeling productive and also acting as a distraction when needed. All of which is really important for maintaining or boosting my mental health. 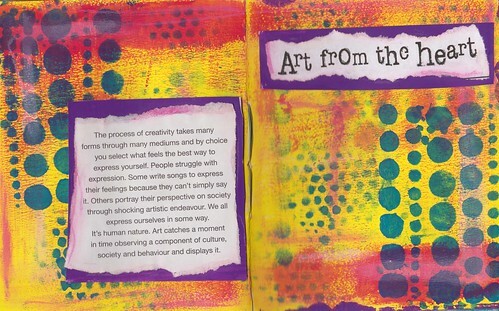 At the moment, the big one for me is art journaling. Art journaling for me has been a huge part of supporting my mental health. I was standing on a beach a few years ago, feeling the weight of depression grasping at my ankles. Having been there before I felt desperate not to let it happen again. It was then that I thought keeping a visual diary or journal might be a way of doing something productive and creative most days but without lots of pressure to complete a huge project. I got myself an A5 notebook, nothing too big or too pretty, nothing that’d overwhelm me. Most days I would do something in it, whether it was as basic as sticking in a postcard from somewhere I’d been that day or writing in a quote that I’d come across. I didn’t want to put pressure on myself – it could be as basic as it wanted, provided I did something on a regular basis. Soon I’d finished that notebook and I’d realised how important it was to me. Being able to do one small thing helps me feel like I have achieved something. And it keeps my creative muscles flexible. I’ve also found that I go through the day with a deeper attention – part of me is looking for things to include in my journal. In the last six or seven months, my art journaling has changed in response to my worsening chronic pain and I’m using different techniques and equipment but the essence is the same; do something small and do it most days. Crafternoon means getting together with friends, family or colleagues and holding an afternoon of festive crafting to have fun and raise money for Mind. Make someone’s Christmas and help us make sure no one has to face a mental health problem alone.